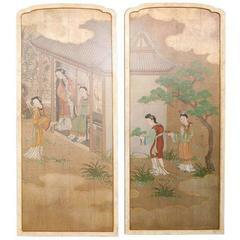 Screen by Robert Crowder. With blue background hand painted pink roses with birds and butterflies. Signed on the bottom right corner. Each individual panel measures to be 25 inches. Light blue Robert Crowder screen with hand painted tree branches with perched birds and little bugs. The top of the screen is detailed in silver leaf. 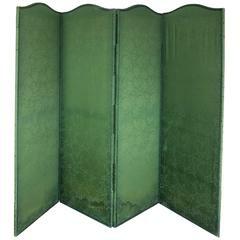 Four panel, green damask screen with blue trim. Semi distressed condition with water discoloration on bottom section of screen. 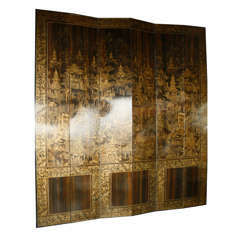 Screen of four bodies in lacquered solid wood, with applications in gold brass and transparent glass. French Victorian style (20th century) blue painted three fold screen with 12 monkey prints (attributed: Nicola Wingate Saul). 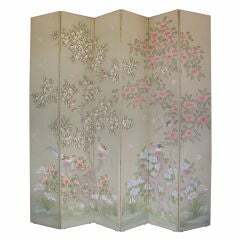 Victorian style screen with needlepoint in front and velvet back. 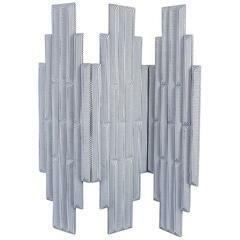 Room divider in die-cut ticking fabric by Erich Ginder Studio. COM fabrics at no additional charge.